Empathy: The capacity to a) be affected by and share the emotional state of another, b) assess the reasons for the other’s state, and c) identify with the other, adopting his or her perspective. 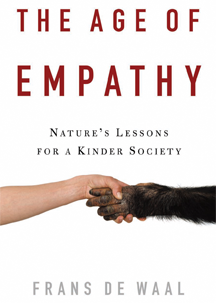 This definition extends beyond what exists in many animals, but I employ the term “empathy” even if only the first criterion is met as I believe all of these elements are evolutionarily connected. Empathy has two sides. One is cognitive, such as adopting another’s point of view, imagining yourself in their place, and recalling your own experiences to make sense of another’s. In psychology, this side is often emphasized, hence the view that empathy is a high level cognitive skill that requires language, and will only be found in humans. This doesn't explain, however, how empathy develops, because no one would deny that a young child is already affected by the moods of those around it before it can speak. The same applies to animals, which clearly transmit moods and states to one another. This is the second side of empathy: the emotional connection. As is clear from my book, I consider this emotional side the core around which all empathy is constructed. Empathy is first of all a bodily and emotional connection. If this core is lacking, you can try to imagine another’s situation as much as you want, you would lack investment in it. You might take the other’s perspective, but we wouldn't call it empathy if you stay emotionally aloof. 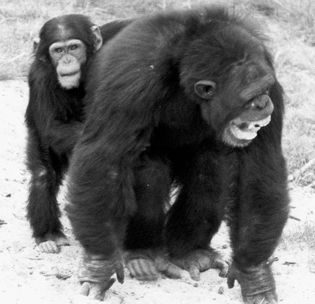 A good indicator of empathy in apes is consolation behavior (see photograph), which is defined as providing reassuring body contacts to distressed others, such as the loser of a fight. Several systematic studies have been conducted on this behavior, a recent one indicating that such body contact indeed serves to calm down the distressed party. The Age of Empathy tries to communicate the layered nature of empathy with the Russian Doll model. I am below showing a fuller version of this model than the one in my book. This one comes from my recent article (pdf below) in the Annual Review of Psychology. I recommend this article and the review paper by Stephanie Preston and myself to anyone who wants to study this topic in detail, and who wants to get a taste of the academic debates surrounding the topic of empathy! Preston, S. D., & de Waal, F. B. M. (2002). Empathy: Its ultimate and proximate bases. Behavioral & Brain Sciences 25: 1-72.
de Waal, F. B. M. (2008). Putting the altruism back into altruism: The evolution of empathy. Annual Review of Psychology 59: 279-300. The Russian Doll model of empathy and imitation. 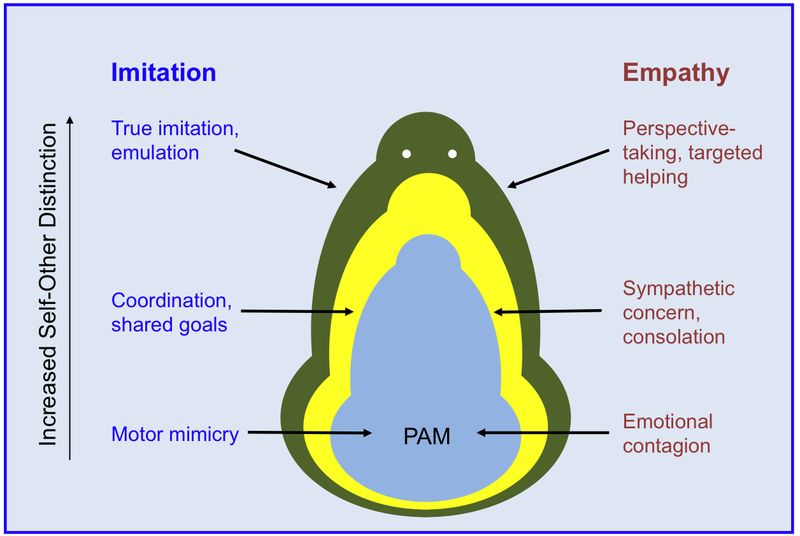 Empathy (right) induces a similar emotional state in the subject as the object, with at its core the perception-action mechanism (PAM), which produces state-matching. The doll’s outer layers, such as sympathetic concern and perspective-taking, build upon this hard-wired socio-affective basis. Sharing the same mechanism, the doll’s imitation side (left) correlates with the empathy side. Here, the PAM produces motor mimicry, coordination, shared goals, and true imitation. Even though the doll’s outer layers depend on prefrontal functioning and an increasing self-other distinction, they remain fundamentally linked to its inner core. Consolation is common in humans and apes, but virtually absent in monkeys. Here a juvenile chimpanzee puts an arm around a screaming adult male, who has just been defeated in a fight. Photograph by Frans de Waal. What do primates teach us about ourselves? Given the common misperception that we stand miles higher on the evolutionary scale, this means that in my book apes move up a few steps whereas humans move down a few. If an extraterrestrial were to visit earth, he would have a hard time seeing most of the differences we treasure between ourselves and the apes. The number of similarities is far greater - from our ears and hands to our sexual behavior and power politics. Within this mass of shared traits a few important differences can be discerned, such as the use of language, but we tend to blow these differences out of proportion. People have a profound need to set themselves apart and feel superior. But in fact, we are not just close to the apes: we ARE apes (To be precise: we belong to the primate order, within which the main distinction is between New World and Old World primates, and between monkeys and the Hominoids. The latter family includes only humans, apes, and gibbons). The human-ape connection is one lesson from Our Inner Ape. To see what it means for human behavior is another, and here I take the stance that not only our undesirable traits, such as violence, but also our noble ones, such as empathy and morality, are part of our primate heritage. There is really no reason to blame human biology for all that's wrong with us, because also all that's right with us is a product of our evolutionary background. The Age of Empathy stresses this continuity and shows in detail how empathy runs through the entire mammalian lineage. Some recent books and articles object vehemently to any talk of mental continuity between humans and other animals. They carry telling titles like Not a Chimp or Darwin's Mistake. This debate is old and will no doubt continue. To make the point how different we are these books and articles like to contrast chimpanzee tool-use, such as a twig to fish for termites, with humans traveling on airplanes with Blackberries. True, there is a difference, but it is mainly one of end products. During most of our history most humans lived extremely simple lives, in which sticks were indeed important tools. It is obvious, however, that we have a talent for cultural learning and transmission, and that this talent is greater than that of chimpanzees. 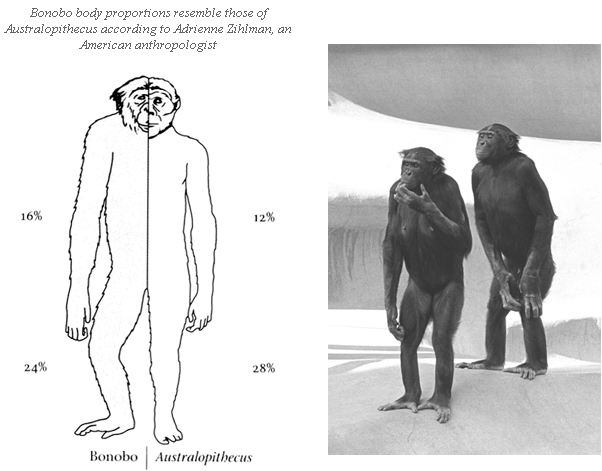 Yet, the cultural abilities of humans and apes are clearly related (see our culture studies web site). When humans apply themselves, as we have been doing in the last few millennia, we can go from a stick to a Blackberry, but even though the end product is now radically different this doesn't mean that the underlying processes have changed to an equal degree. They still remain tied to an ability to use tools, learn from others, and invent new habits -- all capacities common to humans and apes. For a recent debate in Nature about continuity vs. discontinuity, see Darwin's Last Laugh. How different are captive primates? Captive primates get their daily food for free, so they have time on their hands. Their social life intensifies as a result. Captive primates are generally healthier, and hence live longer than primates in the field. They are also less free, but this is a typically human take on their life that may not be felt the same by the animals themselves, especially those born in captivity (some great insights on this can be found in Life of Pi by Yann Martel). This is not to say that we can get all of our information on primate behavior from captivity. We need to know a behavior's natural function to know how it may have evolved. For this, we absolutely need data from the wild. Nothing can replace the arduous work of field primatologists. On the other hand, in the wild it is impossible to do certain behavioral experiments so that conclusions are often hard to draw. For example, if apes in certain wild communities crack nuts with stones, the question is if each individual discovered this by itself or if it copied it from each other. The latter would mean that we call the pattern "cultural," as discussed in The Ape and the Sushi Master. This question is easier to answer with experiments than field observations. We need studies on both captive and wild primates, therefore, to piece it all together and come up with the best possible theories. I do feel strongly that captive primates should be kept in social setting in both zoos and laboratories, preferably with outdoor access. With the decreasing laboratory use of chimpanzees, there is a great need for retirement facilities. I am part of ChimpHaven, an organization devoted to releasing ex-research chimps onto large forested islands. What are the differences between bonobos and chimpanzees? Bonobos are more elegant, longer-legged, and smaller-headed than chimpanzees. There are other anatomical differences, but the biggest difference is in the behavior. For example their voices (click here to listen to bonobo vocalizations) sound totally different from those of chimpanzees. Bonobos are more sexual in everything they do, and adult females often dominate adult males, an unusual situation among primates. The bonobo is little known, but the more we learn about them the more they will help us reconstruct the last common ancestor (the ape from which humans, chimps, and bonobos derive). Some scientists try to keep bonobos on the sidelines, since they fail to fit certain "macho" scenarios of human evolution (which emphasize violence, hunting, and the like), yet bonobos are equally close to us as chimps hence equally relevant. Their behavior is described, and nicely illustrated by Frans Lanting’s photographs, in Bonobo: The Forgotten Ape. A recent attempt by journalist Ian Parker of The New Yorker was to argue that bonobos are in fact more chimpanzee-like than we think, hence that they don’t undermine the traditional nature-red-in-tooth-and-claw image that some like so much. I responded to this imaginative piece in eSkeptic. How does one become a primatologist? You will need a major in psychology, anthropology, or biology. Best is of course to attend a college with professors who do primate work and teach about it. Next best is professors who do animal behavior in general. In order to get accepted in a graduate program in primatology it will be extremely helpful if you have previous experience. This may be a field trip to a place where primates are being studied, a project at your local zoo, or time spent in an animal behavior laboratory. Without such experience, the professors you apply to work with will find it hard to judge if you'll do well with primates. And without field experience it is hard to judge if you will be tough enough for work in the natural habitat (which is physically demanding and lacks many of the usual luxuries of life - some students travel all the way to the tropics only to quit in a matter of days). Foreign language skills are often required. When we judge prospective graduate students, we make a quick distinction between those who merely think primates are cute and likable and those who are more focused on issues that they wish to explore. The latter students are preferred.